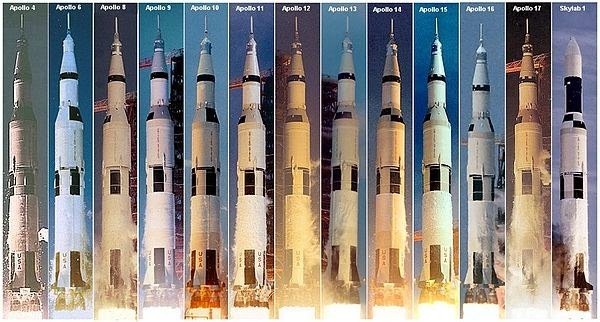 The Saturn V is the largest, heaviest, and most powerful rocket Homo sapiens have ever manufactured. In 13 missions, it took 24 astronauts outside earth's orbit, counting all 12 who ever set foot on the moon, without a single loss of life. Watch in awe as its whole career launches before you. Once again, it's the audio in this mashup that develops my heart racing. News legend Walter Cronkite, covering the first unmanned Saturn V test launch in November 1967, can hardly contain his unstable excitement as the rocket takes flight; the launch was powerful enough to knock down ceiling tiles and closely blow out the blast window in his observation room three miles away. "The roar is terrific!" he screams, 120db of noise and anger swirling around him. 46 years later, it still is.